LA-based zine and comic book artist Yumi Sakugawa’s world, though similar to ours, is unmistakably her own. Though there are bus schedules and dreams, birds’ nests and ramen, there also are elephants in striped shirts and lovers exchanging eyeballs. 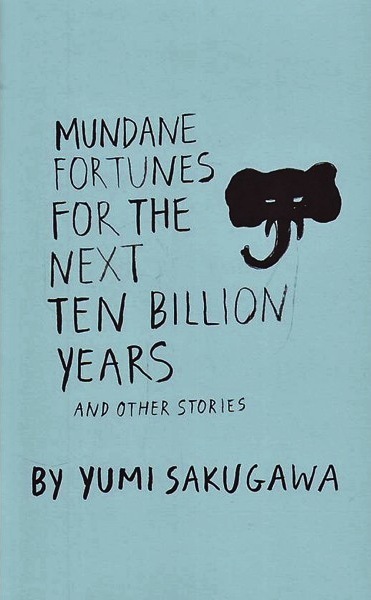 She read the latter story, an excerpt from Mundane Fortunes for the Next Ten Billion Years out loud at Giant Robot 2 on Sawtelle Boulevard this Valentine’s Day in a soothing voice not unlike one you’d hear on a guided meditation soundtrack. Hers is a meditated quirk, a prophetic sweetness that invites the reader to step just one foot to the side of reality and contemplate the history of a lost strand of hair, or a world wherein we might see through each other’s eyes—literally. This promise refers to the book’s emphasis on happenstance and its inherent magical realism. Sakugawa takes the coincidence of life—a bird building a nest outside your window with your own lost hair—and expands it into being just a shade more absurd, a shade too coincidental with visual referents to each preceding fortune in the following frames with echoes of birds throughout the book’s final chapter. Sakugawa loves to lead the reader down this path, one wherein the recurrences of certain images are treated casually so as to fly by unnoticed, and yet their subtlety cultivates a magical atmosphere that waits quietly to be acknowledged. In a similar vein, she places a couple facing a long-distance, inter-planetary relationship in the position of casually trading eyes. Love drugged, the two giggle about the prospect of seeing earth with one eye and “the luminous swirl of distant galaxies” with the other. Of course an exploration of life’s stranger side could lead the reader to feel more alienated by the modern world than she does already. Instead, Mundane Fortunes pulls her close into a literary hug, saying not only is fantasy more common than you would think, but it is a force that can bind you closer to others. With her tender drawings and gentle words, Sakugawa shows us that fantasy and an illustrator’s gaze upon the world can make everything seem tender and special: from picking persimmons to envying one’s sleeping self, there is a gentle beauty to all of it that deserves not only to be documented, but savored. Yumi Sakugawa is a comic book artist and illustrator based in Southern California. She is the author of I Think I Am in Friend-Love With You, forthcoming from Adams Media, December 2013. A graduate of the fine art program of University of California, Los Angeles, Yumi is a regular comic contributor for The Rumpus and Wonderhowto. Her illustrations and comics have been featured on Buzzfeed, Lifehacker, PAPERMAG, Apartment Therapy and all over Tumblr. 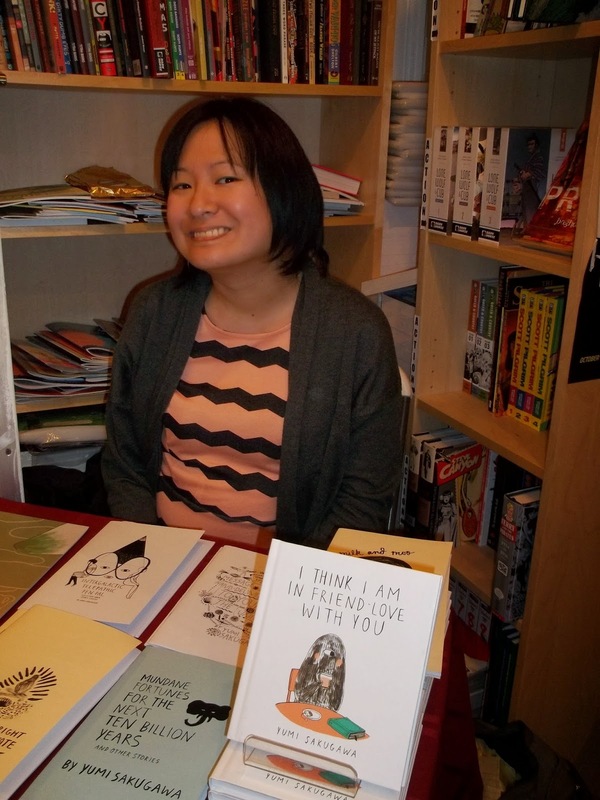 Her short comic stories have been selected as Notable Comics of 2012 and 2013 by the Best American Comics anthology editors. Visit her on the web at www.yumisakugawa.com (bio from The Rumpus).